Now on its second year, Pink Carpet partners with Think-Big Events to showcase some of the finest holiday finds from over 100 established and upcoming homegrown retailers, online entrepreneurs, and celebrity/fashion bloggers like Diana Zubiri, Grace Lee, Will Devaughn, Roxanne Barcelo, Ryza Cenon, Eric Tai, Kakai Bautista, Andy Smith, Camie Juan, El Moda, Denise Lunod, Jaqui Perez, Bea Benedicto, Cristina Decena, Mikki Galang, Jaimie Felix, Julie Ann Lozada, and more surprise guests. Bring your shopping bags with you from December 5-7 and 19-21 at the Metrotent Convention Center, Pasig City and spend your last-minute Christmas shopping with us for a ticket price of P100. Raffle prizes and promotional deals will also be given away by the event sponsors and featured concessionaires every hour on the hour. Expect performances by some of the country’s top acoustic artists, and enjoy exclusive playlists curated by 103.5 K-Lite and 99.5 PlayFM—two of our major radio sponsors. 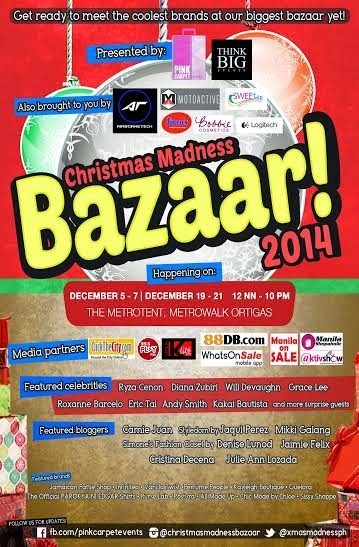 This event won’t be possible without the event’s sponsors: Motoactive, Jinco’s Printing, SweeTen Kitchen, Western Digital, and Equicom – the official card service provider for the bazaar; and our media partners: 88DB, Manila On Sale, ManilaShopaholic.com, Aktivshow, What’s On Sale and Click The City. For inquiries, contact Pink Capet Events at 0925-5138-080 / 02 209 5518 or email us at pinkacarpeteventsph@gmail.com. To find more about ticket promos, you can follow us on kInstagram (@christmasmadnessbazaar) and Twitter (@xmasmadnessph), and add us on Facebook (Pink Carpet Events). really fun idea for an event! i love going to conventions and things like that. This event looks very nice.